Yohji Yamamoto, Kenzo [Takada], and Junya Watanabe. These are a few of the names of Japan’s leading artists, only instead of working with canvas and oils, they work with fabric and thread. From the 1960s to now these designers have made a name for themselves in the fashion world, which has embraced them for their vision and their innovation. But perhaps what they have most in common is the place that gave them their start. All three are alumni of Japan’s prestigious Bunka Fashion College. Known as “Bunka Fukuso Gakuin” in Japanese, or “The School to Learn About Cultural Clothing,” the college’s original aim had been much more modest than festooning the runways of New York, Paris, and Milan. It opened its doors in 1919, under the name Namiki Dressmaking School, to teach young women to do just that: to make dresses. At the time Japanese girls were itching to replace their kimonos with Western-style clothes that they considered to be the uniform of the elite and the enlightened, but first they needed to learn how to sew them. In the 1960s when Yamamoto attended Bunka, girls outnumbered the guys, 10,000 to 1. He told the New York Times, “Girls were everywhere on campus; they hemmed in from all sides! It was a dream come true for me, but seeing them at such close quarters dispelled any illusions I had about women. I think this disappointment was the starting point of my design career.” Some forty years later the male-female student ratio is almost one to one. Back in the late 1960s there was another young man who went to Bunka, who made a huge splash in Tokyo and Paris in the 1980s, whose name I found and wonder if many recognize today. Tokio Kumagaï. He died in Paris in 1987 at the appalling age of forty. (Cancer had found another victim.) 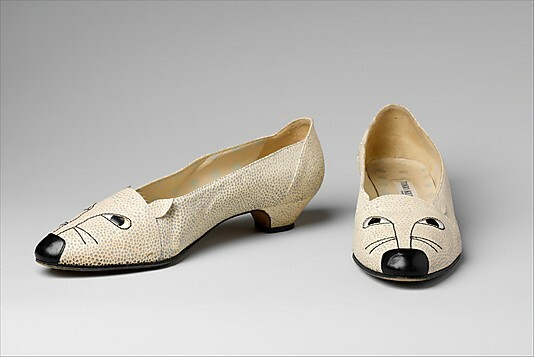 “Many had hopes,” it was written in his obituary, “that Kumagaï would emerge as the new leader of the next generation of Japanese designers.” In the Metropolitan Museum of Art’s Costume Institute collection there is a pair of shoes—alas, not on display—that he designed and hand-painted, that carries an animal face, that became his most famous design. Tokio Kumagaï called his shoes: The Mouse. Other sources: ” Tokio Kumagaï, 40,” Daily News Record, November 2, 1987.